Product of the week time once again! I find it crazy how fast every Friday seems to come round! Weeks are just flying by this year - how is it nearly June?! It will be Christmas and winter coat time again before we know it! Sorry... I'll get back to the subject of this post and that subject being .... my Product Of The Week (duh!) which is the fabulous Rose Silk Finishing Powder from Jurlique! This is a gorgeous loose finishing powder from Jurlique's fabulous Rose collection. I've never been one to pick out Rose as a scent for products - if it has been an option for me before it hasn't been something that I've been drawn too. Well... I was missing out wasn't I! First up I'll talk about the scent. Guess what - it smells like roses! Yes, it is very floral so if you aren't a fan of potent scents like that then this stuff (and particular range) definitely isn't for you. My opinion however is....... I love it! I find the scent so calming and it makes me feel refreshed and ready for the day when I pop it on. I've been using this stuff every day as a last step to my make-up routine. I don't own to many loose powders as I find them quite messy and I find a pressed powder alot easier to work with but the packaging of this powder is great and I haven't made alot of mess at all - phew! For me though, I don't find a puff great for application so I give the pot a little shake to disperse some of the product out and use my big powder brush from real techniques too sweep it all over my face. It is a very lightweight powder and you don't need alot to cover your whole face. 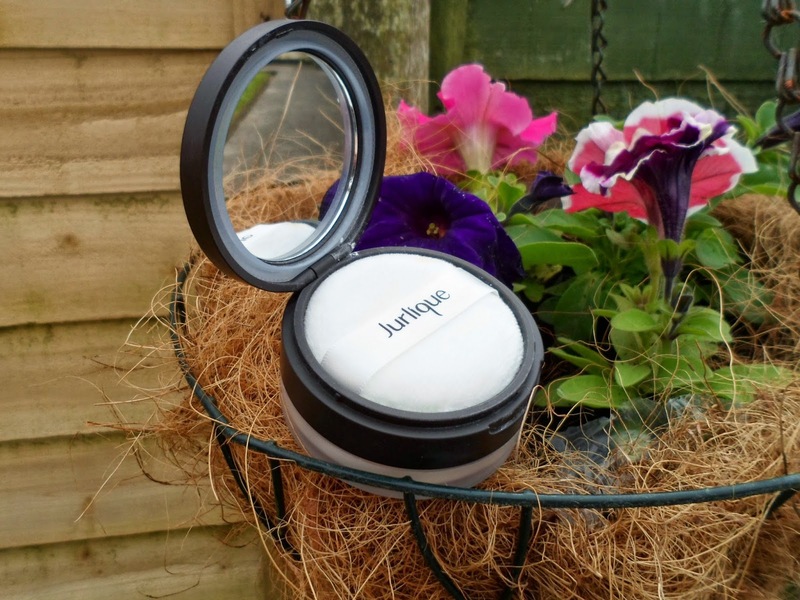 It helps give my face a smooth finish and a has lovely soothing feel - top marks Jurlique. I've also noticed how much better and brighter my complexion has been throughout the day - alot more "radiant" shall we say and some usually oily patches have become less noticeable! Even thought this is a newbie in my make-up collection it is firmly staying in my everyday make-up routine from now on!